Hortus Camdenensis | Salpiglossis sinuata Ruiz & Pav. Half hardy, erect annual with slender, branching stems bearing alternate, long-stalked, lance-shaped, wavy-margined leaves and broadly funnel-shaped, 5-lobed flowers in a wide variety of colours, heavily veined in a deeper or contrasting colour, from summer to autumn. To 60cm. [RHSE, Hortus]. ‘[Salpiglossis picta is] a native of Chili, introduced about the year 1820. Its flowers are eminently beautiful, but it appears to be only an annual plant: however, its seeds are ripened in this country. They should be sown in spring, and the plants, after attaining a moderate growth, may be planted in a warm border, where they will flourish exceedingly, especially in a hot summer. The soil should be rich and light.’ [LBC no.1652/1830]. ‘This genus of very showy plants should be in every collection.’ [PD]. Only one species is listed by Paxton's Dictionary and Don, Salpiglossis sinuata, introduced in 1824, with three varieties, Barclayana, striped brown and bright yellow, an English hybrid; picta, with variegated yellow and bluish-purple flowers; and straminea, described as red and white by Paxton's Dictionary and as having a cream corolla, veined with blue, by Don. Don also describes a hybrid, called by Sweet S. intermedia. Curtis's Botanical Magazine figures S. sinuata var. atropurpurea, the seeds sent from South America in 1826 as S. atropurpurea [BM t.2811/1828], and S. straminea var. picta. The latter had creamy-yellow flowers with distinctive purple-red stripes and is probably identical to the variety straminea described by Don. It was first raised by Mr. Neil near Edinburgh. [BM t.3365/1834]. 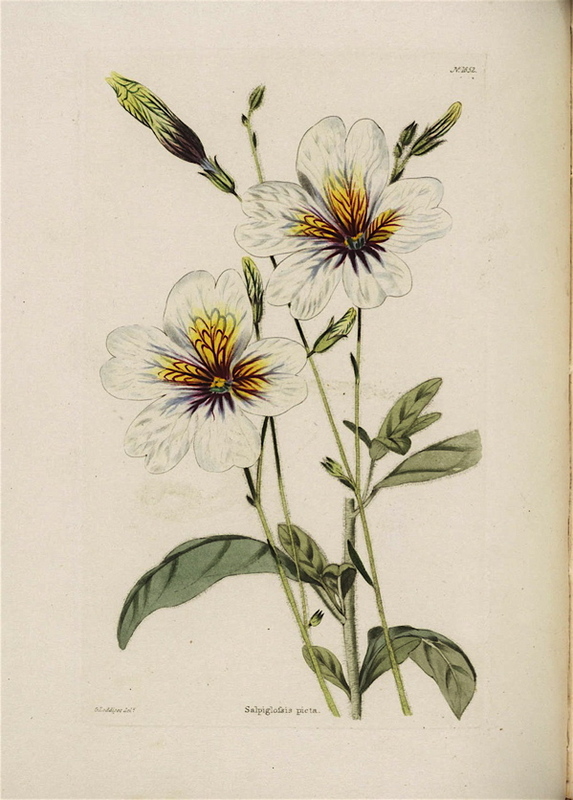 The only reference to this plant is in a letter from Elizabeth Macarthur to her mother Elizabeth, referring to flowers growing in Edmund Blake’s garden. Blake, a convict gardener, probably lived in the cottage at the edge of the garden now called Garden Cottage. Salpiglossis hybrida Hort. ex Vilm. Salpiglossis variabilis Hort. ex Vilm.